Something happens to you when you move to Italy and no matter how hard you resist (and believe me you resist), you become a little (or a lot) Italian. If you have ever lived here as an expat, you know what I’m talking about. If not, you can read this for fun. I have a love hate relationship with this country. I fell in love with it years ago, when I quit my job and decided to change my life by moving here to pursue a new career. I then moved back to Canada, and spent four years traveling back and forth for work and pleasure, until I finally moved back here in 2012, after falling in love with and marrying an Italian man (you may know him as hubby). There’s something magical about this place, the culture, the food, the wine, the picturesque mountains, the seaside, the lakes, chaotic cities and small tranquil villages. You can’t help but fall in love instantly. Then, the reality of living in the chaos, bureaucracy and dysfunction set in, and as a Canadian, you start to hate it just a little bit. I’m not saying Canada is perfect. No country is. But having grown up in Canada and having gotten used to a certain orderly way of doing things, it was difficult to adjust when I first moved here, and I’m not sure I’ve adjusted completely just yet. All of that said, there is no arguing with the beauty that this place holds and the delicious mouthwatering cuisine that has won the world over. When you live in Italy, you come to appreciate the simplicity that IS Italian food. It’s not about complicated ingredients and cooking methods, it’s really about using local, fresh and seasonal products to create traditional recipes that have been passed down from generations. I know it may sound like a cliche, but there is nothing more Italian than a pizza. The cuisine varies by region and sometimes from one town to the next, but pizza is a constant wherever you go. It’s like a ritual, Italians love their pizza and MUST have it once a week. What’s not to love really? The traditional pizza recipe, invented in Naples, is the Marinara; dough topped with tomato sauce, garlic and oregano. Simple and delicious. It has since evolved and there are now thousands of variations on the pizza, here in Italy and abroad. Although Italians will be quick to tell you that it’s a crime to call some of what you find abroad pizza. Now I love pizza just as much as the next gal, but it doesn’t quite love me. I have to watch my intake of both tomato and yeast as they don’t always agree with me. Every week, we pick up a few thin sourdough kamut pizza bases (yeast free) from the organic supermarket, for pizza nights at home. I used to just make myself the Marinara and call it a night, but I’ve recently felt inspired to play with my own pizza creations at home, after we discovered a local pizzeria that had a ton of no cheese, no tomato options on yeast free kamut crust. 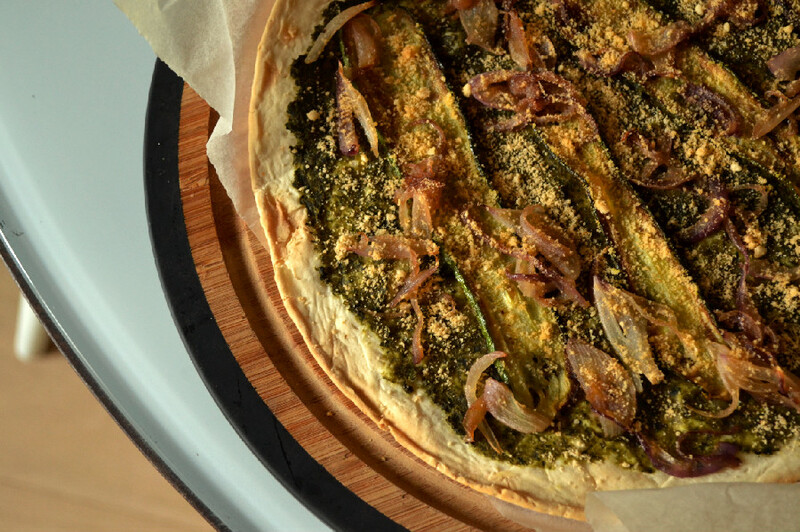 The latest creation is this Green Bean Pesto Pizza. I had it for dinner last night and it was so delicious, I had to recreate it today so I could photograph it and share it with all of you. Incidentally, it also tastes great cold, and trust me I should know because by the time I finished taking all of the shots it’s was already on the lukewarm side. It made a delicious lunch nonetheless. 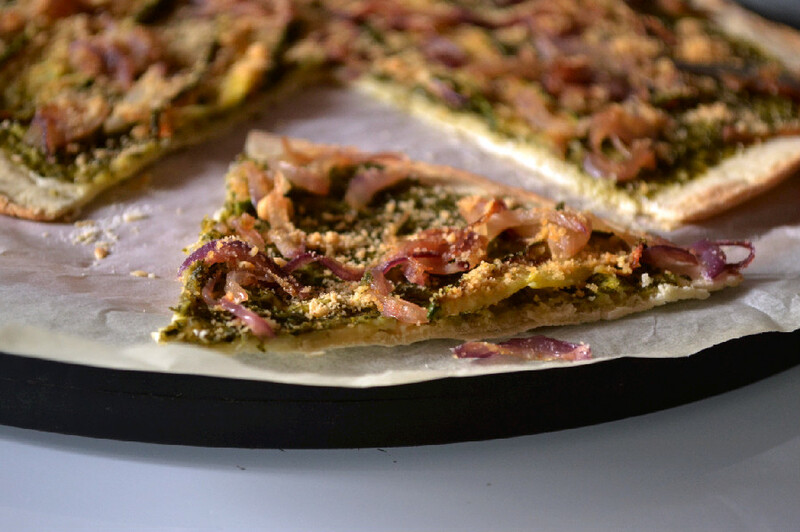 Here’s the recipe for the pizza, the green bean pesto, and the savoury almond topping. A 3 for 1 bonus! This pizza is light,tasty and easy to digest. 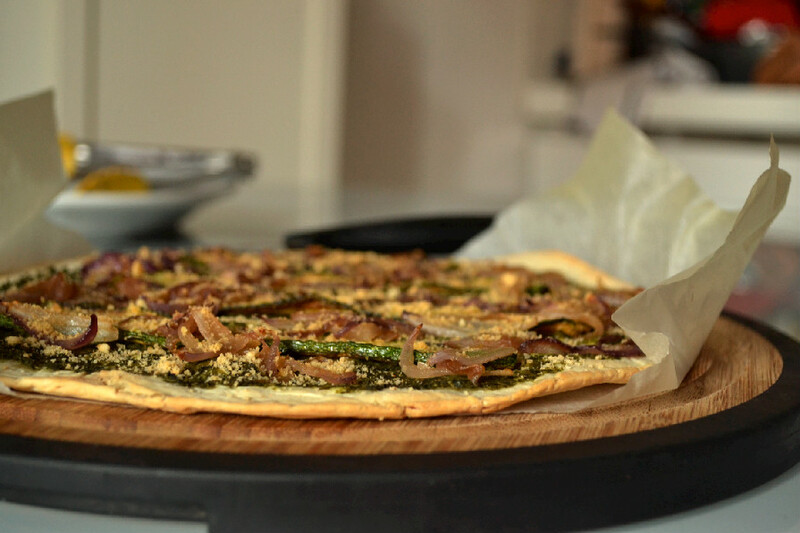 Made with super light green bean pesto, grilled zucchini, caramelized onion and a savoury almond topping over a thin sourdough kamut crust. 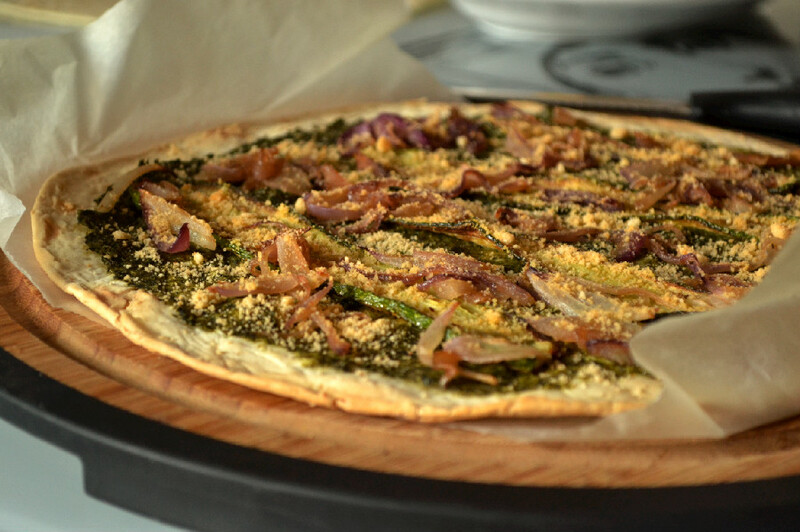 Top the crust with green bean pesto,grilled zucchini slices, caramalized onions and savoury almond topping. Bake in a preheated oven until heated through and edges are slightly browned. Note: Bake time will vary, depending on the crust you use. Some crusts will need to be pre-baked before they are topped, so make sure to follow the package directions for your store bought crusts. If you make your own crust at home, you may need to pre-bake it a bit before adding the toppings and baking again. I haven’t tried this method yet, but when I do, I will let you know. Green beans are blended with sauteed onions and fresh basil for a light, healthy and low fat take on pesto. It’s vegan, and practically oil free and makes a great addition to pasta or pizza. Slice green beans, into 1 inch pieces and place in a pot of boiling salted water for about 10 minutes until softened. Meanwhile, sauté the onions in EVOO, with a pinch of salt, over medium heat until transparent, about 3-4 minutes. Add green beans to onions and sautee for 5 minutes. In a food processor, combine fresh basil leaves, green beans and onions and blend to a smooth consistency. Adjust salt to taste. Transfer to a jar or airtight container and refrigerate for up to 5 days. You can use to the pesto to make pasta or pizza. A little something savoury and smokey to season any meal. Grind the almonds to a fine meal, add salt, garlic powder and smoked paprika and mix to combine. Use in place of parmiggiano cheese on pasta and pizza or to season grains and vegetables.